"Hello, I'm Kenichi Ishihara. Born and raised in Kansai region, I began my career in Tokyo metropolitan area and spent 20+ years there. Now I started my new chapter of life here at Shimonoseki." "Always working in the shipbuilding industry, and in sales except for last year, I have served in various aspect of the ship and shipbuilding, like newbuilding, repair and equipment. Those were busy and fruitful years for me. I feel now glad to get onboard Kyokuyo, company to whom I was trying to sell ship equipment in recent years." 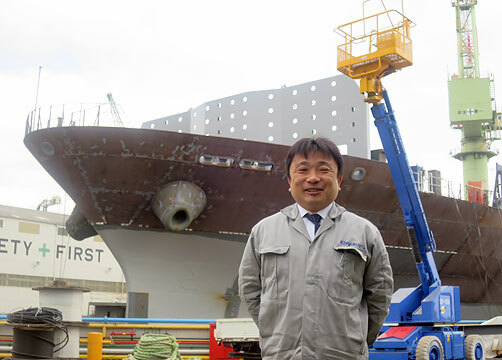 "Shipbuilding business requires teamwork of many people working in different roles - manufacturing, designing, purchasing, marketing and management - and Kyokuyo's strength lies, to my eyes, in its excellent balance among the teams. As a fresh member of "Team Kyokuyo", I will do my best to make the best proposal to my and our / current and future customers." "I look forward to serving you soon !" home > news > News 249 : Say Hello to Ishihara San !